Part of building in a nice cushion of time for the unexpected is that when you avoid the unexpected, you have a long wait. 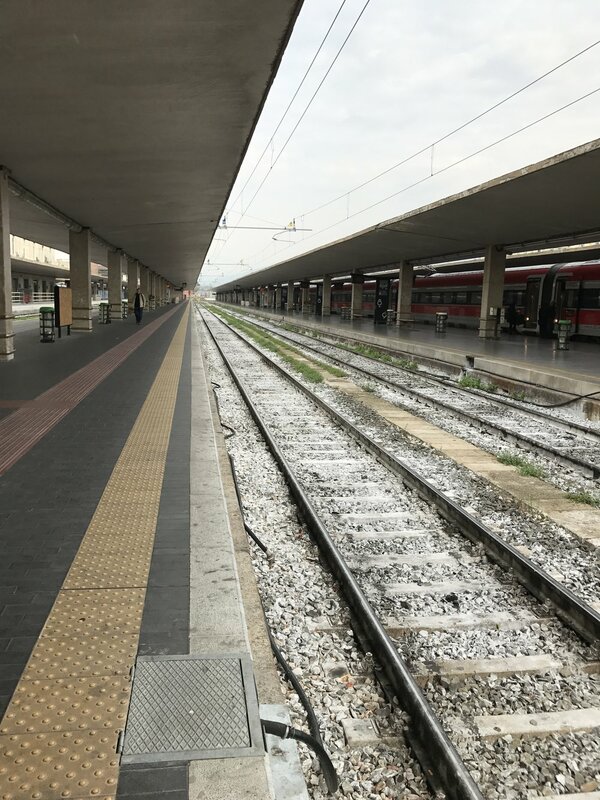 We arrived at the train station just a few minutes after 1100, so we had a wait of 1.5 hours before we could board the Venezia-bound Frecciarossa 9418. Florence has no seating, none, so we stood around for the whole time. We saw several armed Carabinieri patrolling the corridor, a few more local polizia, and even a couple of Italian Army [military, anyway] with a bit more firepower, armed with short-barrel rifles that appeared to me to be 5.56, but they could have been a version of MP5. Both hands on the weapon at all times, I never saw any of them move their hands from the ready-relaxed position. Binario assignment was posted, and a crush of people headed to the platform. They have folks checking tickets before you can proceed down the platform. This is a process change even from 2016, where the platforms were open to all. We walk down to the monitor showing our carriage number, and we wait for the train to arrive. It pulls in, passengers disembark, and we load up for the two hours and five minutes it takes to get from Firenze SMN to Venezia S. Lucia. We arrived in Venice, out the front doors of the train station and you are standing on the edge of the Grand Canal. This spot is always hopping, with lots of people, water taxis, vaporetti, and other canal traffic. It is beautiful chaos, though it can be challenging. We bought a three-day vaporetti pass, waited for #1, the only vaporetto that stops at San Stae, and boarded. Three stops later, off we went with our luggage dragging behind us. The hotel is across one small ponte, sharp right down a narrow path along a side canal, then a left down an even narrower alley to the entry to Giovanelli. We liked this place last year, so we came back. It has convenient access to a vaporetto stop, and there is direct access to the Grand Canal for the trip to the airport. The breakfast is plentiful and good, and the front desk staff is ok, the breakfast staff is wonderful. Checked in and taken to our room... in the attic. No views from this space, but it was a nice place regardless. We both would have preferred to stay at Pensione Guerrato, near the Rialto Fish Market, but both of the past two years, it has been completely booked. No rooms at the inn, so to speak, so we found a different place. Plz. Giovanelli is more expensive, but it is very convenient with a vaporetto stop the short walk away and a water taxi dock immediately off the hotel lobby. Murano-made water glasses. Beautiful and functional! We decided to take a quick shower to wash the 'travel' from ourselves, and then a quick nap. Back out into Venice for a stroll, and to find a place to eat. We wandered around a bit and found a small restaurant for dinner, Al Ponte Storto. We each had a glass of white wine, Laguna and something else that I can't remember, and dinner. Dianne had a linguini with shrimp and zucchini for her primi while I had a spaghetti with clams and mussels. For secondi, Dianne had a mixed fried fish plate and I had the monkfish with tomato, olive, and capers. Both were really tasty dishes. I do not think we have had any 'bad' meals this trip, and we tend to be pretty adventurous. For dessert, I had sweet wine and biscotti, while Dianne had chocolate cake. It was a great ending to our first day in Venezia. We awoke to slightly cooler and overcast conditions. We went downstairs for breakfast, and then decided we needed just a little more rest. We had been going non-stop since we left home on 17 March. We spent the morning being lazy, talking about our travels and concerns and pretty much everything under the sun, journaling a bit, even napping a little, then up and out to walk around Venice for a while shortly after noon. Dianne wanted to see the Frari Church again, so we headed that direction. When we were in Venice in 2008 with Mark and Christy, the Frari Church was undergoing a pretty extensive rehab to prevent it from collapsing, so there was a good bit of scaffold and exposed iron work. We walked in through the entry, and the lady managing the entry told us the church would be closing soon; she did not want us to spend the E6 entry fee only to be kicked out a few minutes later. There was a British lady standing there, who spoke to the entry lady in Italian, and she told us what they had said. We stood there talking to her for a few minutes, talking about the church and Canova and Titian and politics [Brexit and Trump]. As our conversation went on, the church lady started moving the stanchions and getting the church ready for the next day of tourists. When she finished, she leaned into our British friend and said, "You can go in. You have a few minutes to see the church." Together we walked through, looking at the design of the tomb of Titian, the 'scandalous' Madonna [she is not the center of the piece], Donatello's sculpture of John the Baptist, and then it was time to go. Our British friend, Lisa, was really interesting and engaged, so we invited her to join us for dinner. We wandered and wandered and wandered, moving further from Santa Croce and toward Santa Margherita, looking for just the right place. We found a joint that was completely deserted, walked past it, then turned back and went in. Greeted and seated, we looked over the menu, then chose some dishes. We got a bottle of Veneto Merlot to split, and Lisa and I both chose the spaghetti with clams and mussels while Dianne had a bolognese. The food was really good. None of us had a secondi, but we shared a cheese plate and a half bottle of Veneto Cabernet Sauvignon. We sat and talked about lots of things; Lisa is a genetic biologist who teaches. She is a certified dive instructor, and part of her research is done underwater. She had lived in Italy for three years, teaching and researching, which is where she learned Italian. She said it had been nearly 10 years ago, and her Italian was really fading, but she seemed to be picking it up again quickly. After dinner and conversation, she had to leave to make the last boat back to the island on which she was staying. She said this was a last-minute booking, and she could only find a place to stay pretty far out from the heart of Venezia. We plotted our course back to San Stae, taking advantage of Google Maps, and it was a much shorter return than our meandering path to the restaurant. 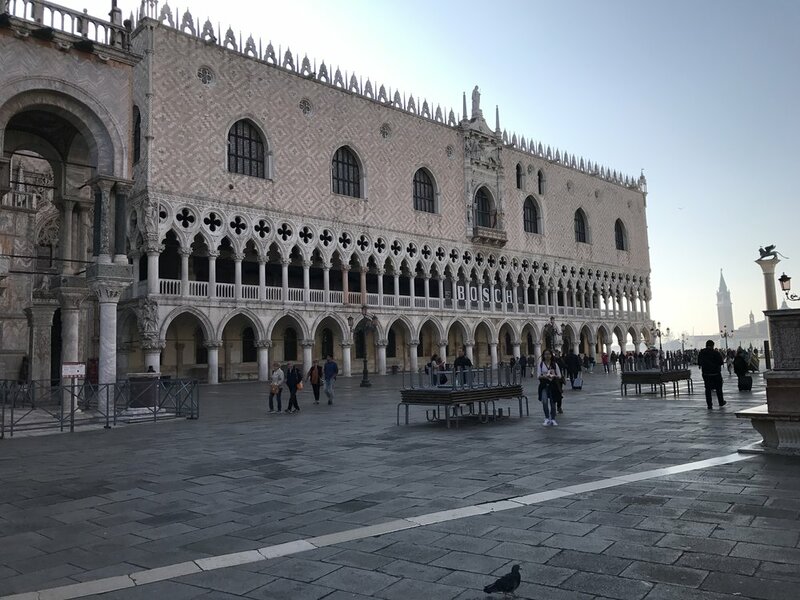 In our resting time on Friday, we booked a tour of the Doge's Palace for 0900, and we made our way over to Piazza San Marco. We walked through Rialto, and this early in the morning, it is practically deserted. And that is how I like it. It can be a crushing crowd in Rialto and at San Marco, but not at 0800. The Rialto fish market was in full-swing. The market has been a daily ritual in Venice for over 800 years. It is a pretty impressive set up, with fresh vegetables and fruits on display, but more, the fresh catch of the day. Squid, crab, tuna, monkfish, sardines... whatever you might want, they likely caught a bit of it last night. This is fresh fish straight from the Adriatic, not frozen and packaged. It is, to my eye, a bit of the magic of Venice. We arrived outside the garden at San Marco around 0840. Plenty early, and we sat on one of the benches, like Cecil and I did in 2007, waiting for our tour group to meet. There were several other people waiting, and when they started moving, so did we. In total, the tour group was 23 people. It was the largest group we have been in on this trip. Avventure Bellisime was the tour company, and they provided everyone with a radio and ear bud. The guide used a transmitter and microphone, so she could speak at a conversational level but everyone could still hear her, even if they were not directly in front of her. Piazza San Marco early morning. This place is packed elbow to elbow within a couple of hours. Sabrina was our guide, and she was fantastic. Lots of history of Venice, how the Doge came to be, the rise and fall of Venice, all of it was two hours of really interesting information sharing and visiting the palace. The palace itself is an impressive space, with the largest room of its kind in its day. The room is 13m tall, 26m wide, and 52m long. It was an engineering feat made possible by what the Venetians had learned as they developed their biggest manufacturing industry: Shipbuilding. The solution to build such a wide-open space was to take a ship and invert it. The trusses they had already designed to build the frame of the ships were perfect to create a wide-spanning roof system. We walked through the open rooms of the palace, and then we crossed the Ponte dei Sosperi, the Bridge of Sighs, where prisoners were sent to serve their sentences. As a tourist, it is fascinating, but I suspect the name is well-earned. It would have been a very depressing walk as a prisoner. The prison itself was a 'luxury' prison compared to any of its contemporaries, and certainly to the prisons it replaced. The original prisons were 'the lead' and 'the pits'; either in the attic or on the ground floor, respectively. Venice floods regularly, so being in the pits would have been cold and wet. In the summer, Venice can easily reach 35C, and temperatures in the attic easily reach 55C, or about 140F. Either condition could easily lead to death, and for many, it did. One other interesting tidbit that Sabrina shared was the number of people who visit Venice annually. It was a staggering number, 25 million. Venice is becoming, if not already, too crowded. The locals are few; they number less than 50k. Many are rapidly deciding that the damage done by the cruise ships far outweighs the small amount of per capita spend those particular visitors inject into the economy versus the amount of space and public services they require. We saw several signs that said, "No grande nave", meaning no big ships. They still love overnight visitors because they are the life-blood of the city. Food, shopping, hotel nights are all things that the overnight visitors spend money on while in Venice. Although, the 'room tax' levied by the city has gone up 3x since last year. In 2016, it was E1.5/night/person; in 2017, it was E4.5/person/night. For a five night stay for two people, that is an extra E45 that has to be paid in cash. Ponte dei Sosperi and a line of gondolas! The cash requirement has always bothered me. It seems there would be way too much opportunity for leakage, but I suppose it has to do with the cost of credit card processing and the hotels balking at covering that cost to collect a tax that does not drive anything to their bottom line. 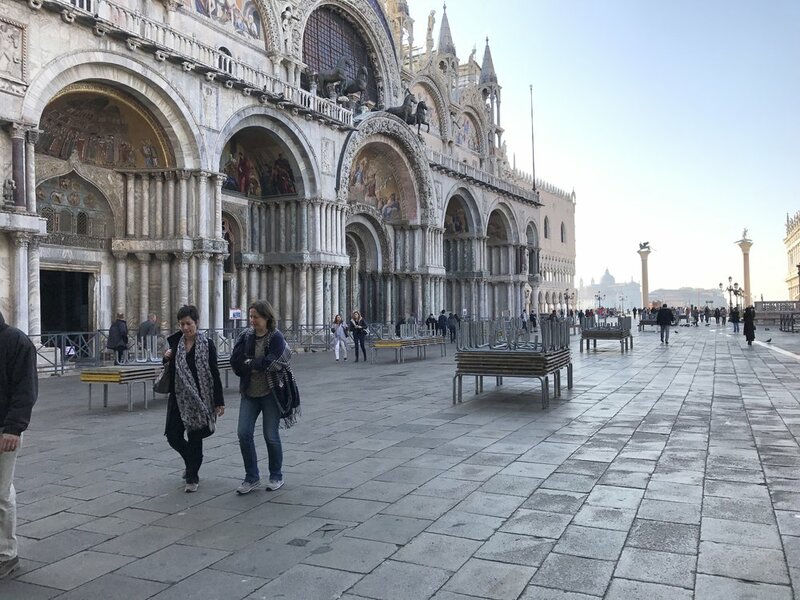 The tour ended, and Dianne and I headed out into the now-crowded Piazza San Marco. We were looking for lunch, and we had a pizza at one of the pizzerias a few streets back from the crowded piazza. The meal was good, and we shared a 375mL bottle of Valpolicella, a fairly light and fruity wine, that paired really nicely with the pizzas. After lunch, we went to the Correr Museum. The ticket we purchased with our tour included access to this museum too, and it was another new something for us to experience in Venice. The Correr, like the Ufizzi, has lots of art. There is more pre-Renaissance art than I find particularly engaging. I moved ahead of Dianne into some of the other spaces. It was an interesting experience, but for someone who appreciates the room more than the art, an hour or so is plenty. One of my favorite things from this museum is the view of Piazza San Marco, the crowds, the campanile, and the Palazzo Ducale. You stand on the second floor [third, in US terminology] and have this beautiful view of the chaos. When we left the museum, we walked back over to the hotel, took a quick rest which was mainly a potty break and a quick call home, then headed back out to find a place for dinner. We decided to find something in 'our' neighborhood, and we walked up to Osteria Antico Giardinia. We had passed this place every day on our exploration of Venice, so we stopped. They had room for two without a reservation, though I think we got their last table of the evening. Neither of us made notes of the meal we had, but it was very good. Laurena was our server, and Dianne said she sounded like a young Kathleen Turner. While we were eating, we ran into a couple of old friends. Rebecca and Elizabeth, two of the four Australians from our Wine Tour in Tuscany trip to Montalcino on Wednesday were just finishing their dinner and walking out. We stood up, chatted with them for a few minutes [this was their last night before returning to London], and then they headed out. It was a bit of a shock to meet friends we had just made in Tuscany again in Venice with no pre-arranged meeting or even notion that they were going to be in Venezia. We finished our meal with a tiramisu for Dianne and biscotti and vino dolce for me, capped by an espresso for each of us. Back to the hotel for a good nights rest.